What would high school be without the traditions of prom, pep rallies, yearbooks and the class ring? Finding the perfect class ring, that speaks to your career as a student but also represents your high school, can be a challenge. Fortunately, class rings can be customized to make a statement that shouts your name and no one else's. It will be a keepsake you will treasure for the rest of your life. The easiest way to choose a custom ring is through companies that specialize in personalized class rings. Artcarved has been in business since 1850, making it one of the oldest, most established companies to order class rings from. Reviews of Artcarved rings on Joy Jewelers (an online authorized dealer) are mostly four or five out of five stars. For example, the 18-karat-gold Sunshine Class Ring has a five-star rating from a reviewer who says the high school student is "thrilled to have such a unique ring." Step One: Choose the ring style. There are 10 different styles for guys and 19 different styles for girls. Step Two: Choose a metal. Artcarved offers yellow gold, golden siladium, silver select with platinum, white gold and siladium (stainless steel, but looks like white gold). You will then choose a finish. They offer natural or antique, which has a darker background. Step Three: Choose the stones you want for your ring. Some people choose to go with school colors, others choose a birthstone, and others choose simply what they love the most. Artcarved offers the ability to insert a laser image that reflects within the stone. For example, you could choose a number that represents your number on a sports team or an emblem such as a megaphone for a cheerleader. Step Four: Add embellishments such as numbers on the side, your school mascot, or your school name encircling the stone. This company offers six different styles and pages upon catalogue pages of activities and engravings from which to choose, making this ring uniquely yours. View their catalog online, and then order the ring at your nearest retail store. The rings are offered at JC Penney, Zales and several other retailers. You can also search for your nearest store by plugging in your zip code. Jostens is well known in the halls of high schools. You can design and personalize your class ring online, however, many schools invite representatives to the school to help students order their rings. Jostens encourages high schoolers to order the rings as early as freshman year, but offers guarantees on their class rings and will even offer a discounted replacement ring if the ring is lost, needs to be resized, or something changes such as class year (graduating earlier than expected). They call this their limited lifetime warranty. Although Jostens is one of the most popular customized ring providers, reviews are mixed. Some reviewers were aggravated on shipping costs, customer service and errors. However, another reviewer was thrilled with the service at a local store and warranty work that was completed, free of charge. In addition, Jostens offers an intuitive online ring designer, that helps you narrow down choices for customization, making the process of choosing a little easier. Balfour was established in 1913 to produce college class rings. Today, in addition to making high school class rings, the company is also known for producing championship rings for Stanley Cup, World Series and Super Bowl champions. Balfour has an A+ rating from the Better Business Bureau (BBB). Step One: Choose a ring style. There are two different series for girls to choose from and one for guys, but multiple styles of rings under each series. Step Two: This step offers you the ability to choose a metal such as Celestrium, silver with platinum, white gold in 10 karat, 14, karat or 18 karat, Imperium, or yellow gold in 10 karat, 14 karat or 18 karat. You will also choose metal finish (antique or natural), palm side of the ring (smooth or sculptured) and inside graving (add your name or initials, for example). Step Three: Choose your side designs. You can also enhance your graduation date with a small side diamond. Step Four: Choose gemstones, lasering for gemstones and other embellishments for the front of your ring. Rings are typically ordered through a personal consultation with a representative that visits the high school. However, you can also order by phoning 1-800-BALFOUR (1-800-225-3687). 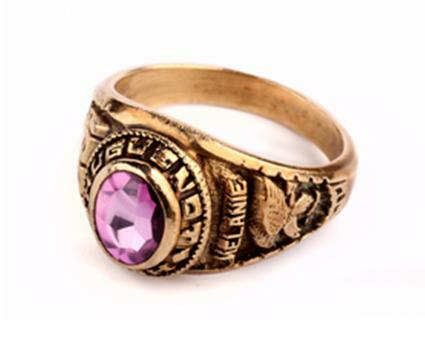 Herff Jones started in 1920 making class rings along with pins and other school products. They have also craeted rings for the NCAA Championships and Super Bowl XLI rings for the Colts Super Bowl win. One reviewer gave the company high marks on Insider Pages, stating, "I couldn't have imagined a more beautiful class ring than the one I got from them." Personalize your ring with a simple four-step process. Step One: Choose a ring style. Herff Jones offers six styles for young men and 11 styles for young ladies. Step Two: Choose the metals, and other details in your ring by selecting from alloyed metal or gold (white or yellow), choosing a natural or antique finish, choosing palm side options (hand-sculptured or polished) and adding engraving. Step Three: Make stone choices, such as gemstone, stone cut and additional features such as sunburt effect, vistaview, rainbow burst and etchings. Step Four: Add your first name and choose side options. This company offers some unique options with the gemstone embellishments and icons such as a majorette boot or a tornado. Dunham Manufacturing may offer deals on class rings, but they don't skimp when it comes to customer service. Multiple customer testimonials on their website speak of this excellence in service as do reviews on Yellow Pages. The company also has an A+ rating with the BBB. The company has been in business for more than 20 years. All the gold the company uses in their jewelry starts in .9995 form and is alloyed to meet industry standards. Even better, rings start as low as $56 each. Choose from one of seven different lines with multiple styles in each line. The ring can then be customized in white or yellow gold in 10 karat, 14 karat or 18 karat, silver, or a variety of alloys made to look like silver or gold. Choose a gemstone. All birthstone months are available along with a couple of additional selections, such as "Fire Blue" or "Padparadscha Orange". On the next page, you will choose your size, add engraving on the inside band, and choose engraving for the sides. How much personalization depends upon the ring style you choose. Wider bands allow for additional elements and thin bands may only have room for some letters and numbers. There are other sources for purchasing class rings. Walmart offers an affordable selection of rings, including those from Artcarved, as mentioned above. If you want a truly unique ring that no one else will have, you can also hire a local jeweler to create a custom design or a metal worker to make something that speaks to you as a student. Keep in mind that any ring can be engraved on the inside to make it unique. If you fall in love with a ring at a local jeweler, but it isn't specifically a class ring, don't rule it out as an option. Talk to your jeweler about adding features that will make it more like a class ring, or see if he can design a class room for you. The most important thing is that you have a ring that you love and that you will want to wear for many years to come.